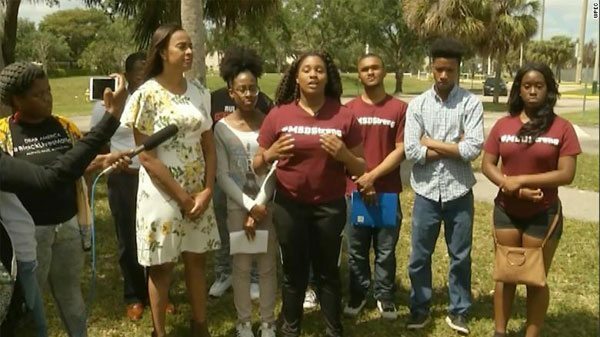 Black students at Marjory Stoneham Douglas High School held a press conference last week to tell the world that the response to the February shooting—increased school policing—does not make them safer and, in fact, harms them. So, even though we are on alert for another white shooter, black and brown students are being profiled? Such is the illogic of racism. A 2014 fact sheet from the Department of Education’s Office for Civil Rights noted that, during the 2011-2012 school year, black students were suspended and expelled from school at a rate more than three times greater than white students. When broken down by race and gender, the OCR notes that black girls are suspended at six times the rate of white girls and at twice the rate of white boys. Collectively, this disparity fuels what has been called the “school-to-prison-pipeline,” a systemic bias that civil rights advocates say pushes children and young adults of color out of the classroom and into the criminal justice system. Harris quotes, Tiffany Burks, a local Black Lives Matter organizer who helped the students organize the event, as saying, “Including black students in the gun violence conversation means broadening the topic from mass shootings to police-involved shootings.” This simple inclusion would in turn jumpstart a more inclusive set of solutions. How do you build a moment into a movement? While movements can flourish for idiosyncratic reasons, past social movements offer us some useful guideposts.